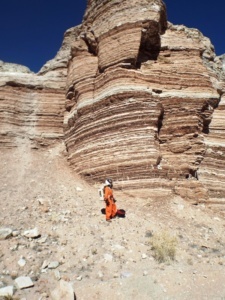 One of my favourite locations at MDRS since by first crew in 2004 is a box canyon in the Lower Pinto Hills. To me it has some of the most martian-looking landscapes in the area. The box canyon is one of many formed by the erosion of the thinly bedded mudstones and gypsum of the Summerville Formation, the thin green gypsum-rich Tidwell Member of the Morrison Formation, capped by the resistant sandstones of the Salt Wash Member of the Morrison. This is a very rich site for Mars analogue research and is an excellent Mars analogue with respect to geomorphology (both canyons large and small are common on Mars) and chemistry (evaporite sediments are also widespread on that planet). 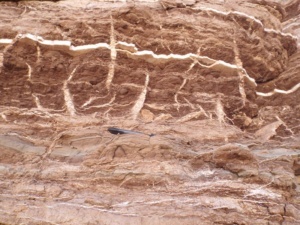 Bedded gypsum evaporites of the Summerville formation (white beds) – targets for halophile exploration. The first time I was here you could climb up a talus slope of large blocks to the upper surface. There were groundwater seeps underneath the sandstone. These was studied by Crew 11 for biological microenvironments . The sandstone cap was later quarried for local use, so a steep track was put in to the top which made access much easier. I revisited the site with crew 92 to test portable diamond drilling on the gypsum-rich sediments. 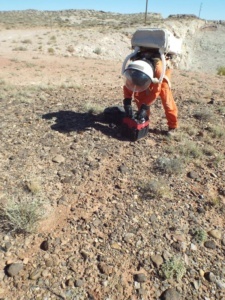 A third visit with crew 104 saw the successful sampling the sandstone, mudstone and gypsum for organic matter. So when I was invited to join the M160 crew I immediately looked forward to revisiting this area. The site can only be readily accessed along a sealed road so it requires use of the MDRS car, a 4WD Ford Explorer seven seater that, for analogue purposes, we call a “Pressurised Exploration Vehicle” or PEV. On this visit we had four goals: introducing Anushree to the gypsum-bearing sediments to understand how the were formed, to sample the four different gypsum styles for later analysis for halophytic organisms preserved within them, sample lichens, scout for hypoliths, and for Annalea to develop field drawing skills while in with the PEV. This is a potentially useful skill for martian astronauts, as field drawings allow key features of the landscape to be captured and emphasised. Working inside a EV is much easier than inside a simulated space suit, and much long range reconnaissance exploration on Mars will most likely be done inside such a vehicle. Looking for lichens on woody debris underneath a small shrub. The EVA was a success on all fronts. 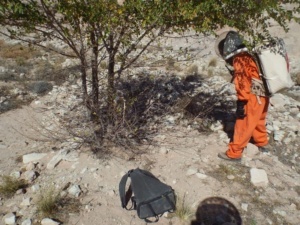 Some difficulty was experienced integrating space suit and PEV operations and valuable lessons were learned for next time. We sampled all modes of gypsum occurrence at the location, and found new lichen environments on moist boulders in shadowed areas. We also found some and sampled new lichens on rotting wood at the foot of 1-3 m high shrubs and small trees. The landscape above the box canyon is capped by old terrace gravels, these are both colonised by lichens and have hypoliths beneath the quartz pebbles. We plan revisit this site soon to carry out systematic documentation of hypolith distribution and sample for analysis back at the station. Collecting hypoliths from old terraces gravels above the box canyon.